Given the fact that written science fiction encourages the greatest possible free play of ideas, why is it that filmed science fiction almost always seems required to be dumb, dumb, dumb? You can count on one hand the recent s-f films that have contained truly challenging ideas: "2001," of course, and then "Silent Running," "Zardoz" (for its story but not its ending), "Close Encounters of the Third Kind," and, for certain of its scenes, "Alien." Certain other s-f movies have redeemed themselves by sheer visual energy and high spirits; "Star Wars" is the obvious example. But how, this late in the game, can we still get movies like "Saturn 3"? Who paid for it? The credits name Lord Lew Grade and Elliott Kastner. They've got a tidy little partnership over in England that's well enough financed to chum out about a dozen international releases a year, some of them as good as "The Muppet Movie," most of them as bad as "Saturn 3." The level of intelligence of the screenplay of "Saturn 3" is shockingly low - the story is so dumb it would be laughed out of any junior high school class in the country - and yet the movie was financed. Why? Why couldn't Lord Grade and Kastner for once decide that since they'd committed themselves to spend this money anyway, they had nothing to lose in financing a creative and intelligent screenplay? Why do they feel compelled to support the lowest common denominator, of filmmaking? 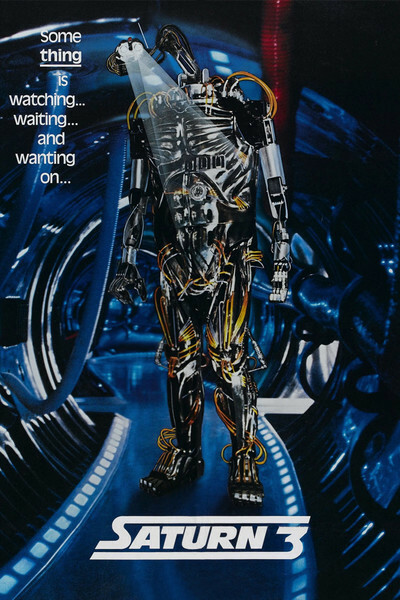 And, all right, then: How dumb is "Saturn 3"? 1 will give you an example. The movie's about Kirk Douglas and Farrah Fawcett, who are the only two crew members on Saturn 3, a space research station near Saturn. They have a visitor, who is supposed to be a Captain James, but is really the evil Benson (Harvey Keitel) who has killed James and replaced him for reasons of his own. Benson has brought along a robot named Hector. And, toward the end of the movie, Hector is chasing Kirk and Farrah. So what do they do? They remove the floor panels of the space station and cover the hole with a flimsy material, so that when Hector steps on it, it'll collapse, and Hector will fall through to the bitterly cold cauldron beneath. Amazing! We haven't seen this brilliant idea since Tarzan was putting stakes in the bottoms of holes to catch elephants. And Tarzan, at least, would have been bright enough to realize that if you make a hole in the floor of a space station, your atmosphere will rush out explosively. How can they still get away with disregarding all the elementary laws of physics in science fiction movies? But this movie's dumb in other ways, too. The love triangle between Douglas, Fawcett and Keitel is so awkwardly and unbelievably handled that we are left in stunned indifference. The purpose of Keitel's visit is left so unclear we can't believe Douglas would accept it. The hostility of the robot is unexplained. And then there are dubious details like (a) the spaceship whizzes through the rocks in the rings of Saturn without hitting any of them; (b) the space station is rambling and spacious despite the fact that every square inch of construction would be at an incredible premium millions of miles from Earth; (c) gravity is the same as on Earth; (d) ... but never mind. This movie is awesomely stupid, totally implausible from a scientific viewpoint, and a shameful waste of money. If Grade and Kastner intend to continue producing films with standards this low, I think they ought instead, in simple fairness, to simply give their money to filmmakers at random. The results couldn't be worse.